Most breeds of domestic ducks have been derived from wild Eurasian Mallard ducks over many generations. Muscovy Ducks were originally native to South America. Ducks can be messy but they can make great pets, the bonded ones have delightful 'attitude' to a degree that that is rarely seen in other species. * Ducks must have access to water at least deep enough to submerge their heads while eating or drinking. * Ponds should be kept clean. Provide a roosting area (an old tyre works fine) and grass or other soft surface to protect feet. Duck housing should provide sun and wind protection. * Place food and water dishes so that ducks do not pass droppings in them about 1 metre apart. * Avoid access to lead or zinc objects such as coins, toys, nails, solder or loose wire. * Protect from predators, especially foxes- Secured in pen or house that will protect them from predators. * Feed a combination of formulated chicken or duck pellets and mixed grains (barley, wheat, rice). Also give dark leafy green and yellow vegetables (spinach, silver beet, carrots, beans, peas, broccoli, seeding grasses, etc.) and a protein source (eg meat, legumes, fish or egg) daily. * Fruit may be offered, as can multi-grain bread, pasta or human table scraps. * Avoid chocolate, coffee, alcohol or avocado as these may be toxic. * Commercial duck and chicken pellets are used for birds being fed to produce meat, eggs and liver pate and can be too high in nutrients for pet ducks if fed as their sole food source long term. * Pododermatitis (‘bumble foot’); Duck Vets often see cases of deep bacterial infections in the Ducks foot. * Female reproductive problems such as egg yolk related peritonitis; and egg binding. * Phallus injuries in males if several drakes are trying to mate with one female, especially with Muscovy drakes. 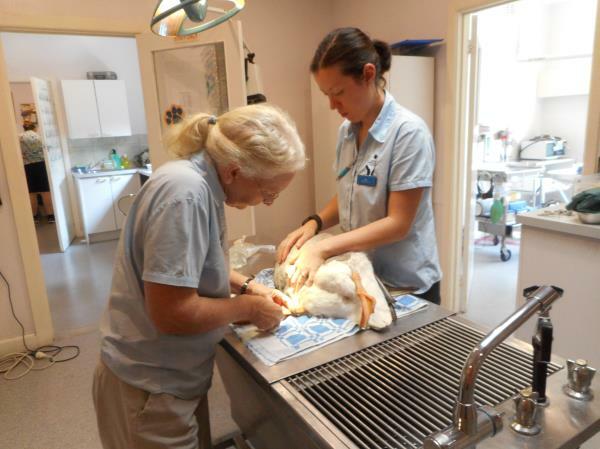 see pic Bird specialist vet Dr Pat and avian nurse Kim putting up an i/v line for fluid therapy for a duck in shock. 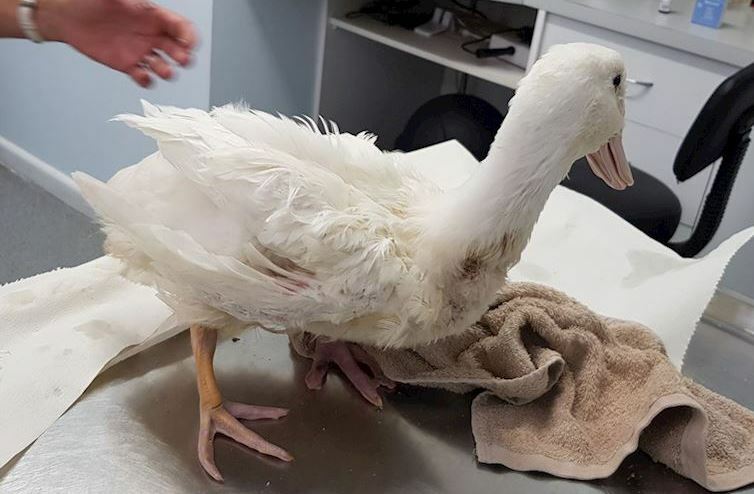 We at Bird Vet Melbourne recommend a Avian veterinary health check (with testing as appropriate), when you acquire your new pet duck and annually by a Duck Vet thereafter for at least one member of the flock. Ducks often hide signs of illness and may only appear unwell when they are very sick. It is important to seek advice early if your Duck or Drake looks unwell. Ducks and chickens are common pets at out Melbourne bird vet. We are seeing more and more chickens and ducks presented for veterinary treatment. Melbourne bird vet is Victoria's only bird specialist, bird veterinary clinic with three avian vets. Bird Vet Melbourne is located centrally in Melbourne Metro . The clinic is operated by bird specialist veterinarian Dr Pat Macwhirter, Avian Vet Dr Philip Sacks and Bird Vet Dr Michelle Sutherland.